Wing Commander Prashanth is one among many unsung heroes who have brought smiles to the faces of anxious and panic-stricken people of Kerala. Visuals show Wing Commander Prashanth airlifting the two-year-old boy and bringing him to safety. 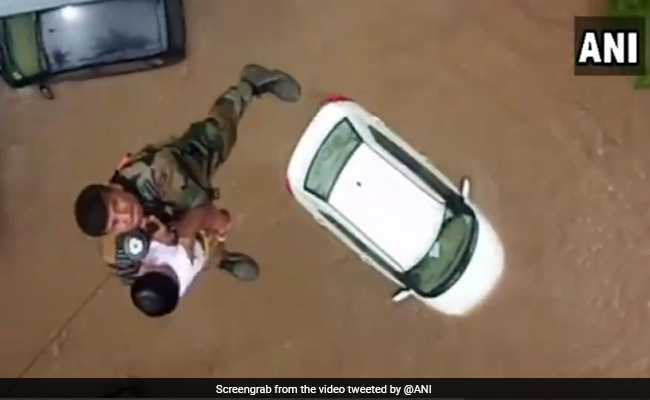 Braving inclement weather and risky conditions, a young Air Force officer dramatically winched up a toddler to safety from the roof-top of a marooned house in rain-battered Kerala. Thousands of people are battling all odds to survive as the death toll has touched over 160 in the past 10 days in the second spell of monsoon fury since August 8. TV visuals showed the officer airlifting the two-year-old boy with care, pressing him to his body and bringing him to safety. They cried and hugged each other after all the stranded were safely pulled up into the helicopter on Saturday. Union Tourism minister K J Alphons, who visited some relief camps in Thiruvananthapuram today, said they are the 'unsung heroes'.